Brahms' Piano Quintet in F minor, referred to as the "crown of his chamber music," features surprising shifts of tonality, daring use of harmony and sudden emotional contrasts, which make this innovative chamber piece a singularly profound concert experience. This timeless masterpiece showcases the composer's most well-known elements-richness of texture, unexpected episodes of darkened mystique, unsurpassed lyricism of the slow movements, undisputed mastery of chromaticism and artistry in writing for every instrument. Prokofiev's Overture on Hebrew Themes, composed as a sextet for clarinet, string quartet and piano, highlights a combination of instruments rarely experienced in chamber music repertoire. Commissioned by a Russian sextet called the Zimro Ensemble shortly after Prokofiev arrived in New York in 1918, this work features melodies inspired by Jewish folk songs. The true mystery of this work comes from the uncertainty of whether Prokofiev composed the songs' themes or if the sextet's clarinetist Simeon Bellison (1881-1953) composed the basic melodic ideas. Whatever the case, this overture is a work of great exotic beauty. Also on this program is the highly dramatic and original music of Alfred Uhl (1909-92), an Austrian composer, conductor, violist and music instructor. 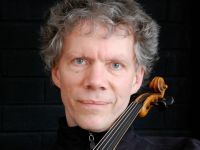 From commanding a French prison camp during WWII to serving as a distinguished faculty member at the Vienna Music Academy, Uhl created music that is harmonically daring, rhythmically dynamic and melodiously innovative. The Kleines Konzert (Little Concert) for viola, clarinet and piano is grand in scope yet intimate in presentation. Featuring Uhl's chosen instrument, the viola, this trio ingeniously combines expansive orchestral textures with stunning chamber music virtuosity to simulate the sound of a concerto.